As a small business owner, you expect big things from your cash management system. Now Sharp, the biggest name in ECR technology, introduces the ER-A440 - an ECR designed to deliver big performance, big features, and big results in your day-to-day operations. Sharp understands that bigger isn't always better, especially when it comes to factors like price and size. So we've designed the ER-A440 to make a big impact or your business, not on your budget or your counter space. The ER-A440's user-friendly keyboard and built-in training mode will have your staff up and running in no time. 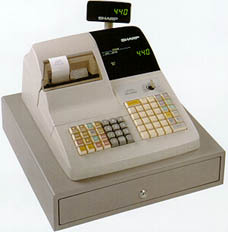 The keys and LED display are significantly larger, more readable, and easier to work with than other cash registers. Changing pricing or adding new items to your menu or stock is never a problem thanks to the ER-A440's easy programming feature. And with the standard RS-232 communication port, you can connect your PC to the ER-A440 in order to upload or down load item, pricing, and sales information in a matter of minutes! Paper-less flash reports provide managers with critical, up-to-the minute sales/transaction data, so there is no need to wait for printed reports. In addition to flash reports, the ER-A440 offer a variety of printed reports which cover all areas of sales and transaction analysis. Choose from eight, twelve or sixteen character text descriptors to track departments and PLUs with as much or as little detail as you need. Auto keys on the Sharp ER-A440 provide one-touch recall of, series of key sequences. Easy to program, the ER-A440's advanced functions can be automated in a matter of minutes. The Sharp ER-A440 can also accommodate an additional cast drawer (for a total of two) and 99 coded cashiers, so multiple employees can operate the same register without any Loss of accountability. A food stamp capability provides an audit trail for food stamps tendered. Age verification allows you to monitor sales of age-restricted items for compliance with federal, state and local regulations. In addition, single line validation allows the operator to mark documents such as checks and gift certificates with time and date information - for better record keeping and security. The new Sharp ER-A440 is built for maximum reliability, even with heavy usage. In addition to its solid construction, it can be customized according to the changing needs of your business. With more features, more performance, and more flexibility for your dollar, the ER-A440 gives you the competitive advantage you need to thrive in today's marketplace. Rugged architecture ensures years of reliable operation. Compact, cost effective, and loaded with powerful features, the ER-A440 is the small ECR that thinks big for your business.